“The Game with Objects”, a video-installation by artists Tea Tupajic and Petra Zanki, will be shown in Studio 2 at MDT, April 14-17 from 11am to 8pm. The installation is the result of the work completed during the artistic residencies for “Curators’ Piece” project. 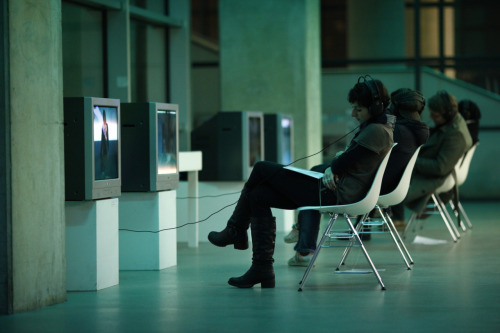 The video was filmed along 2010. on several venues and festivals in Europe and USA, where the artists visited the chosen curators during their research for the performance. This video-installation issue from the second working session entitled “The Game with Objects”, in which the artists presented various objects to the curators asking them to imagine the objects as artists and performances and chose 10 among them in order to make their festival or season. Created by: Tea Tupajic, Petra Zanki. Curated by: Sven Age Birkeland, Barbara Raes, Lane Czaplinski. Montage: Hrvoslava Brkus?ic?. Production: Banana Gerila 2010. Thanks to: BIT Teatergarasjen, BUDA, MDT, On the Boards, steirischer herbst, PACT Zollverein, PS122.